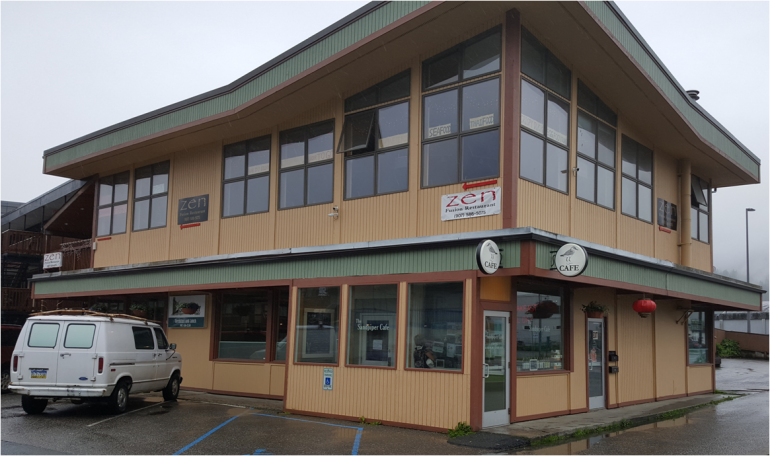 The Sandpiper Cafe is a popular spot whether you are looking for breakfast or lunch. The Cafe is small and there is often a line of people waiting for a seat. Upon entering, you will encounter a simple interior with gray painted walls. Occasional sandpiper figures appear on the sills. You will find The Sandpiper Cafe downtown at 429 West Willoughby Ave.
Once seated, your host will immediately fill your water glass while offering the menu. Breakfast offerings feature standard dishes. 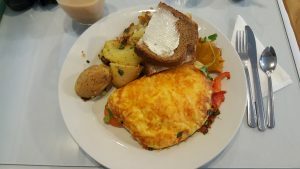 I ordered the Smoked Salmon Omelet, a popular dish featuring Alaskan Salmon. The omelet arrived in good time and was delicious! Drawbacks, however, include the cost of the meal. You will definitely pay for the restaurant’s reputation! Additionally, the wait staff were not the most prompt I’ve experienced. I had to ask another staff member for my check. 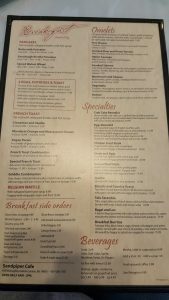 Overall, if you are interested in experiencing a popular tourist destination, the food at The Sandpiper Cafe will not disappoint you. There are, however, more enjoyable local destinations offering more bang for your buck. My go to place for breakfast in Juneau. Love, love, love their french toast! The Vegan french toast is delicious even to a non-vegan like myself. Serving sizes are generous. Love their wild game burgers. I have not been as pleased with other non breakfast items on the menu however. Service was good. Every server I have had has been friendly and attentive. Host staff not so much with one exception. Gets very busy weekend mornings.